Marquise diamonds are a very unique shape, with two pointed ends and a wider spread in the middle of the stone. Designing a ring for the marquise cut can be a challenge because of the unusual shape and the sharp ends. 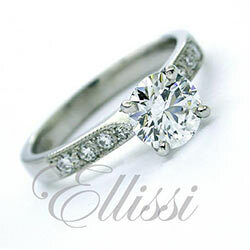 For those who want a diamond ring that is less commonly made and interesting in shape, it can work very well. Added to this is the fact that the marquise cut are is one of the larger diamonds weight for weight. They generally come with a better price attached because they are also one of the less costly cut types. Marquise diamonds are not represented in any great numbers on this site, although we have made many more rings with marquise centre stones than are presently shown here. There are a few reasons for this, but primarily it is because the Ellissi site reflects the results of our work and the rings show the choices our clients have made. Marquise diamonds are not requested as much as other shapes, so this means we tend not to make as many. It is a pity really because it is a very interesting cut with a distinctive shape, and can make a really stunning ring. Click here for more info on the Marquise Cut. “Stella” Intricate Marquise diamond halo ring. “Marchese” bezel set Marquise diamond ring. “Clamshell” unusual design Marquise diamond ring. “Marquess” Baguette and Marquise cut diamond ring. “Tasha” stunning Marquise cut diamond solitaire. “Nirvana” Marquise cut solitaire, pavé diamond band.